In 2017, the Chinese New Year takes place on January 28th, with festivities lasting all week long, and we know the perfect way for you to celebrate. The recently released Gong Xi Fa Cai slot is all about honouring this special time of year and is full to the brim with the traditional lucky charms of China. Perfectly timed to welcome in the Year of the Chicken, the slot is hosting a massive £15,000 cash giveaway. The Gong Xi Fa Cai Cash Giveaway will have an astounding 1,500 winners randomly selected from prize draws across multiple casinos. Will you be one of these lucky players? 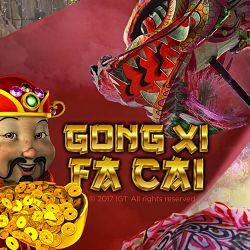 Gong Xi Fa Cai means “wishing you a prosperous new year” and this IGT game is definitely the right way to go about that. Colourful imagery and high-quality animations set the slot firmly in the Far East. Symbols on the reels include animals, dragons, hanzi lettering and fish. The background is filled with floating lanterns, piles of glittering treasure and a cheerful, wealthy emperor. There are five reels and 50 fixed pay lines to play with here. By adjusting the number and value of coins, the slot can be spun for as little as 50p or as much as £750. 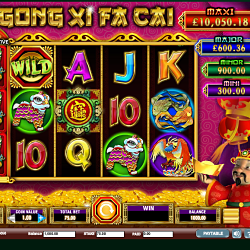 On top of this exciting base gameplay, Gong Xi Fa Cai has some brilliant bonus features on offer including multipliers and free spins. The promotion is active at Mr Green Casino, Bgo Casino and Mecca Bingo from January 26th until February 5th. During this time, you can earn entries for the grand prize draw simply by playing the slot at any of these sites. Every £10 you wager at Gong Xi Fa Cai will earn you one draw entry. There is no upper limit to how many times each player can be entered into the competition so keep on playing for higher chances of being one of the lucky 1,500. The draw will be held on February 6th, one day after the promotion has closed. All customers at the casinos taking part in this Cash Giveaway are welcome to join the promotion. It is possible for players to win more than one prize, if their name is randomly drawn more than once. All winners will be contacted by the casino they joined the promotion through on February 6th.